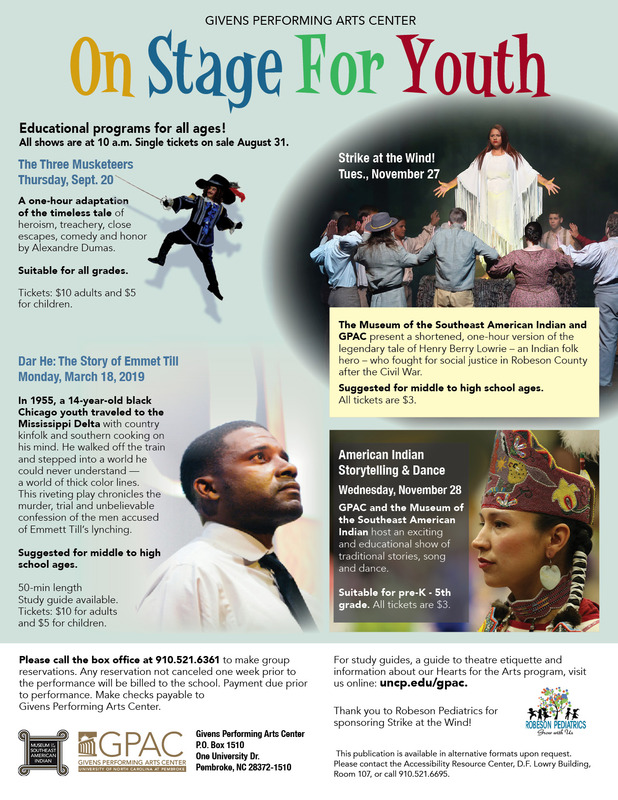 Educational programs that bring the classroom to the stage! Please call the box office at 910.521.6361 to make group reservations. Tickets are sold on a first-come, first-served basis. Please provide the name of the school, contact person and number of students and chaperones. One chaperone ticket is complimentary with the purchase of ten student tickets. Any reservation not canceled one week prior to the performance will be billed to the school. Single tickets can be purchased online. All shows are at 10 a.m. In 1955, a 14-year-old black Chicago youth traveled to the Mississippi Delta with country kinfolk and southern cooking on his mind. He walked off the train and stepped into a world he could never understand — a world of thick color lines. This riveting play chronicles the murder, trial and unbelievable confession of the men accused of Emmett Till’s lynching. Suggested for middle to high school ages. Tickets: $10 for adults and $5 for children.